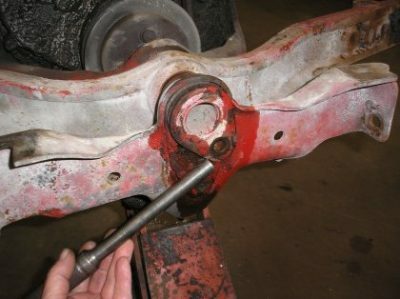 The front axle center pivot pin or “king pin” on the 2N, 8N, and NAA tractors wears badly over the years from a lack of lube. 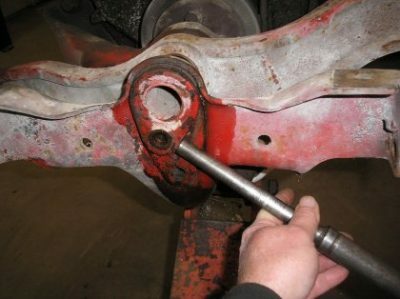 It also tends to become bonded tightly in place by rust, especially on the front side, which makes removing it very difficult. The trick to getting it out fairly easily is to break that rust bond loose. I start by soaking both ends of the pin with penetrating oil. Then, after removing the retaining bolt, I use a drift and a hefty hammer to rotate the front flange on the pin to one side. An air hammer works well, too. Once the rust breaks loose and it moves one direction, soak it with penetrating oil again and drive it the other direction. Add some more penetrating oil and repeat as many times as necessary until it moves freely. You can now use some suitable prying tools under the flange to work the pin out of the bore easily.